The generation of the Second World War are fading fast; several WW2 veterans I knew passed away this winter and now comes the news that my old friend John Dray (above) has died. John Dray grew up in the shadow of the Great War, a period in history that would fascinate him for the rest of his life. His father was a Kitchener’s Army volunteer who was wounded three times in the war, wounds that would eventually kill him when John was only twelve. For John his father was always his hero, and he became obsessed with reading about his father’s war. During the Second World War John watched his elder brothers go to war; one in the artillery, one later in the LRDG and SAS and one in the Glider Pilot Regiment. John initially joined the Home Guard and made several attempts at enlisting under-age, finally joining up aged only 17 – although he had convinced them he was 19 – in 1943. He was proud to be posted to the same regiment his dad had fought with, the Northamptonshire Regiment, and served with their 5th Battalion in Italy at the Sangro River, Monte Cassino and later in the Liri Valley, where he was wounded by a sniper. In late 1944 he was transferred to the 2/7th Queens and was badly wounded by an S-Mine in the attack on Faenza in December 1944. That was his war over. After WW2 John returned to his interested in the Great War and met Tony Spagnoly when they worked together; Tony would go on to write many books on WW1 and John took him across on his first trip to the battlefields. Together John and Spag began to take veterans back to the battlefields when few others did and in the 1960s during the 50th Anniversary he went on every major anniversary trip, with a coach load of veterans behind him each time. The things he saw and heard then would fill a book. 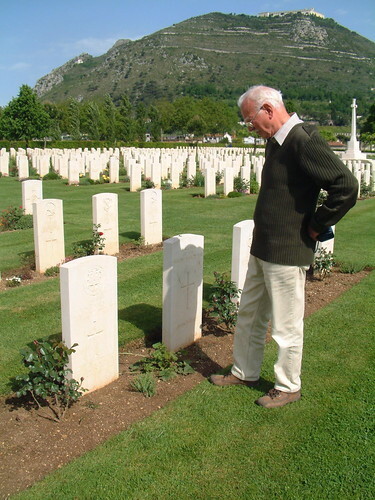 I was lucky to know John for more than 25 years; we went on many battlefield trips together from Gallipoli to the Western Front and many WW2 sites as well. 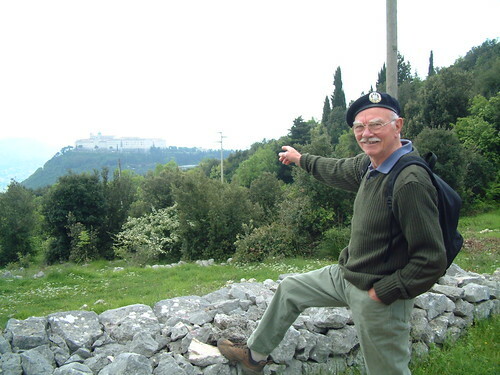 Ten years ago I went with John back to the places where he had fought in Italy and the recording below comes from those trips, standing on the Snakeshead Ridge in front of Monte Cassino. John was also one of the original team of Leger holidays battlefield guides who worked with me on their tours from 1997 and until he retired in 2003 took many thousands to the old battlefields and gave them the benefit of his incredible knowledge and amazing stories. I realise each time I write one of these tributes to old friends and veterans I have known that they must sound the same, but for John I find it hard to put him into words. He was simply one of the most incredible men I ever knew; a tough soldier, a man who lived the ‘good life’ in rural Devon and was at one with nature and an incredible raconteur and good drinking buddy. And I shall miss him terribly. A great tribute to a good friend. A fitting tribute Paul. I remember John well from those early days with Leger, he was quite a character and a great man… RIP John. We owe a lot to this generation, lets hope we can keep alive the record of what they have done for the younger generations and those yet to come. A fine tribute Paul.